On page 53 of a book entitled Recovering Biblical Manhood & Womanhood John Piper said, “If I were to put my finger on one devastating sin today, it would not be the so-called women’s movement, but the lack of spiritual leadership by men at home and in the church. 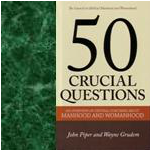 Satan has achieved an amazing tactical victory by disseminating the notion that the summons for male leadership is born of pride and fallenness, when in fact pride is precisely what prevents spiritual leadership.” From this book presenting and defending the historical, and biblical understanding of men and woman comes this month’s selection 50 Crucial Questions (50 of the most commonly asked questions concerning the roles of men and women and what the Bible actually says). You’ll have at your fingertips short, comprehensive, biblically consistent answers to all those questions you or your friends may ask about this thorny issue. 1. Why do we regard the issue of male and female roles as so important? 2. Where in the Bible do we get the idea that only men should be the pastors and elders of the church? 3. What is meant by submission? 4. Where in the Bible do we get the idea that husbands should be the leaders in their homes? to the epidemic of wife abuse? 6. Why is it acceptable to sing hymns written by women and recommend books written by women but not to permit them to say the same things audibly? The issue of one’s security in Christ (eternal security) is one that often plagues more believers than we might imagine. For some the trouble it causes them is deep and profound. Believing that answers to the issues we face and that true comfort comes by the Holy Spirit using the living Word of God, it is to the Holy Scriptures that we must turn. 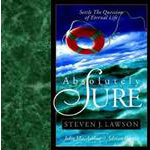 Absolutely Sure is aptly titled as it shows through the Word how we can be absolutely sure of our eternal rescue from death to life. This is a very good book to both read and give to anyone, not just those who may struggle with their security in Christ. “Why am I here? And while I’m here, is the reason for being here going to shape the way I live?” In a world where options are thrown at us at breakneck speed, it’s more and more difficult to hear and live the only true answers, and according to John Piper, the result is an epidemic of wasted lives. 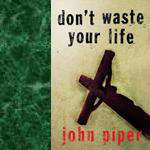 Piper offers a timely challenge to young and old alike in what I believe may be one of his most valuable books yet, Don’t Waste Your Life. John Piper takes readers through his own personal journey to find purpose, and challenges them to understand what it means to glorify God in both our lives and our deaths. By focusing all our lives and selves on bringing glory to God, he reminds us that we can avoid wasting our lives on “fatal success”—i.e. living by the lies of what we erroneously believe gives meaning and purpose in life. Don’t Waste Your Life is a powerful reminder of who I am, why I am here, and what I’m called to do and be. Particularly helpful is Piper’s challenge to all of us (especially young people) to avoid the deadly traps of materialism and to pursue a lifestyle of missions and mercy. Millions of people are wasting their lives pursuing dreams of happiness that don&apos;t rise above a good marriage, nice kids, a successful career, a nice car, fun vacations, nice friends, a fun retirement, a painless death, and (hopefully) no hell. Piper calls this a tragedy in the making. He argues that we were created for joy. We were designed to have one life-encompassing passion. In this book he describes his own journey in discovering this great, single passion. And He pleads that at all costs we pursue our joy in the crucified Christ, who is the glory of God. The cost is great. But the joy is worth any cost. Don’t buy seductive, tragic promises of worldly joy. Don’t waste your life. The words we speak have great power, and God expects us to use our words to glorify Him and one of the ways that we do that is through encouragement. 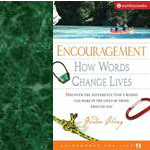 Our new selection deals with just that entitled Encouragement: How Words Change Lives is truly an excellent read. For many, our Sunday conversations (or conversations on any other day) rarely get past the weather, sports or what we did yesterday. And though there’s nothing wrong with this, it’s a wasted opportunity. Especially when we are commanded—to speak God’s life-transforming word and thereby encourage each other. So what is "encouragement" exactly? And how does it work? In this book, Gordon Cheng explains what encouragement is and how all of us can make one simple and foundational contribution to church life by encouraging others. You’ll discover how encouragement is not only central to our church life; it is part of one of the most powerful themes in the whole of Scripture: the power of God’s word to change lives. The death of Jesus is of foremost importance for the world. And the central issue of Jesus’ death is not the cause, but the meaning—God’s meaning. 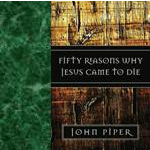 In this book, revised and updated from the previously published The Passion of Jesus Christ, John Piper has gathered from the New Testament fifty reasons behind the crucifixion of the Christ. Not fifty causes, but fifty purposes—in answer to the most important question facing us in the twenty-first century: Why did Jesus suffer and die? Fifty Reasons Why Jesus Came to Die is written so that both Christians and non-Christian readers sense the book is addressing them (because it is!). It is at once both devotional and evangelistic. I was saved, by God&apos;s grace, when I was 19 years old. I started Bible College when I was 19 years old, I got married when I was 19 years old and I surrendered to preach when I was 19 years old. I guess that was a busy year. As a young Christian I was energetic and enthusiastic about Church, college, marriage and Bible Study. I dreamed of being a full-time minister of the Word of God and pastoring a congregation that loved the Lord and hungered for His Word. I believed I had a bright future and that I was on the correct path. At the close of my first year in college I was introduced to a program called "Summer Missions." By going to a mission field for three months I could earn six college credits and benefit from the wisdom and experience of working with a seasoned missionary. During the first week of summer break, I accompanied the youth group from my home church to an inter-state mission located in Denver, Colorado. We spent three days there and led in community outreach, youth programs and a three-day revival, which I preached. The missionary on the field was reported to be one of the best in our work. He was said to have a heart for souls and a reputation as a soul-winner. At the close of our three-day trip I inquired about the possibility of returning to work with him for the rest of the summer. He was delighted and I quickly set the wheels in motion to get signed up for the summer missionary program so I could apply it towards my college degree. I went to Denver and worked with this missionary for three months. I enjoyed my time there and wish I could report that I learned a great deal but in retrospect I realize that I didn&apos;t learn much nor did we accomplish much. At the close of my three-month stay, the missionary approached me with a serious question. He said he had been extremely discouraged on the field and had been debating whether or not to stay. He said that my visit was a breath of fresh air and that my company really inspired him to continue on and work for the growth of the church. He also asked me if I would come back. He said he had been praying about this for several months and felt led of the Lord to approach me on the matter. He said that he felt certain that this was the Lord&apos;s will and then he said, "I&apos;ve never been wrong about this feeling before." (Notice that this is in quotes. These were his words.) He had it all figured out. The wife and I could live in the basement of his house, which was really a complete apartment of its own. I could enroll in the Western Bible College and continue with my education and the wife and I could assist him in the work at the mission. He believed that the Lord had laid this on his heart and that it was the Lord&apos;s will. I told him I would give it some thought and prayer and mention it to my wife when I got home and then get back to him. I wrestled with this for a short time but decided it was the thing to do. After all, this respected missionary felt good about it and he had never been wrong about these feelings before. We sold all of our possessions. We only kept what would fit into the smallest U-haul trailer you can rent. We left our jobs and our home in Arkansas and headed west. We stopped off in Hope, Arkansas to let our families know of our decision and tell them of our plans. While at my wife’s parent’s house, I called the missionary in Denver to inform him that we were on our way. He told me that he had just gotten off the phone with the director of missions to tell him that he was resigning and going back to Alabama to retire and devote his time to his Christian bookstore. The mission was to be dissolved and the property was up for sale. So, there I was. At my in-laws with no belongings, no job, no place to go and no future to look forward to. It was only the beginning of a series of bad decisions that led to nowhere. I wrestled with this for years and I&apos;ve gone over all of the "woulda - shoulda - coulda&apos;s". I take responsibility for my part in the failure. I shouldn&apos;t have been so willing to believe the impressions that someone else had. The entire incident took place because of bad theology. Theology that replaced the Word of God with the fickle impressions if a sinner&apos;s heart. Feelings cannot be trusted. Yes, the Holy Spirit is in us and the Holy Spirit leads us but not by the reigns of our old nature. Not by our feelings which can be deceived by prejudice and circumstance. God has given us His Word and it is the only safe harbor in which to anchor our souls. The subjective authority of "I feel led" or "God has impressed me" or "I feel moved of the Spirit" is not the theology that Christians should rely on. Neither should they rest their hopes in such a theology or in those who practice such theology. Brethren, if error is harmless then truth is useless. What a tragic story, thank the Lord it turned out well in the end, though some problems had to be overcome. So what about you? Are you led by God? How do you know you are being led by God? Do you hear God’s voice? Are you sure it’s His voice? This question plagues some Christians and others ought to ask them. Many decisions have been made, many things have been done by those who say, the Lord led me to do, or the Lord laid it on my heart, and other similar things. Have you ever said that? Should you have? Where you really led by the Lord? How can we know the will of God anyway? For my fellow bookworms this year’s first selection will answer all of these questions and instruct you as to what the bible says concerning this issue. This short 46 page booklet is loaded with information, is easy to understand, may change the way you think about being guided by the Spirit, and will give you assurance that you are being led and how you are being led by God’s Spirit. 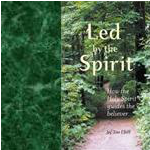 Led by the Spirit, How the Holy Spirit Guides the Believer by Jim Elliff is a must read and is a great book to give away to friends and family. Remember many what many believers believe about how God leads them is not scriptural so they need this book whether they know it or not. Living the Cross Centered Life will challenge you as it did me to ponder anew each and every day the wonders of the cross of Christ! You will enjoy the last few chapters where there is a great comparison/contrast between justification and sanctification. For some this is still a point of confusion and this is helpful in understanding the heart and mind of God in these matters. The truths found in these chapters along with the chapter on Legalism are profoundly liberating. It isn&apos;t up to me to be justified! It has already been done! In the end allowing this book to be applied in your daily life will transform your Christian walk. 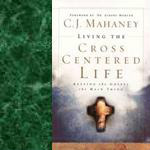 Living the Cross Centered Life is not just a point of view from C.J. Mahaney, but Biblical truth freshly and wonderfully communicated. Respectable Sins, is a book about sin, but it deals with the sins that we often do not take seriously. 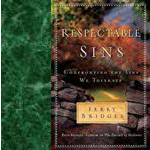 Jerry Bridges understands that Christians have a way of focusing on the sins of society around us while overlooking the sins so prominent in our own hearts and lives. He takes the scalpel of the Word of God and performs spiritual surgery on our hearts by exposing the cancerous sins which are destroying us spiritually. After exposing our sin, he offers hope of obedience through the gospel. This book will be tremendously helpful to all of us, and it will accomplish several goals if read with humility. First, it brings sins we often neglect to deal with and lays them before us in plain sight. How many of us have even thought about our impatience this week? Most of us haven’t because it’s a sin we have learned to live with. Have you given any thought to your lack of self control today? I didn’t think so. Secondly, this book focuses on heart issues and not externals. Sins of the heart are serious before the Lord, but we neglect them because no one else sees them. Respectable Sins drives our attention inward to our own hearts. Thirdly, after compelling us to look inward, our gaze is driven upward to the gospel. This book thoroughly explains how the gospel confronts our sins and shapes our lives. Finally, this book helps us to take sin seriously. As explained in the book, our culture seems to brush sin aside with ease. Respectable Sins will help us realize the malignancy of sin. As believers, we often fall prey to the assumption that those who are busiest, are most spiritual. We look at the people in our churches who are involved and assume that they are the ones with the greatest measure of spiritual health. But do you think that is the measure God uses? Or does he have a different set of criteria by which He judges spiritual health? This short but powerful book examines the Bible&apos;s teaching on this matter. 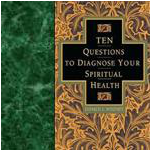 Ten Questions To Diagnose Your Spiritual Health, presents the reader with ten criteria that can point towards spiritual health. The theme that flows throughout the book, is this: is your character becoming more like Christ&apos;s? 2. Are you governed increasingly by God&apos;s Word? 4. Are you more sensitive to God&apos;s presence? Each of the questions is approached and evaluated in the light of Scripture. Far from being yet another self-help or an easy-answer, ten-step book, this one is deep and penetrating. Reading this book and meditating on the questions will be sure to move you towards a deeper relationship with Jesus. Will it never end? 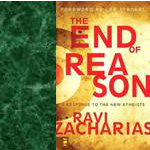 Book after book, one atheist after another all claiming that they have written to end humanity’s scourge, and what is that scourge? What is the curse we must bear? It is that facet of society that believes in God, they are the source of terrorism, the source of conflict and tension. Why if they would join the rest of the world and think rationally they would not believe such nonsense much less kill and destroy in the name of God. Sam Harris is one such author, he says about his own book; The End of Faith (he has also written A Letter to a Christian Nation) provides a harrowing glimpse of mankind’s willingness to suspend reason in favor of religious beliefs, even when these beliefs inspire the worst of human atrocities. This important and timely book delivers a startling analysis of the clash of faith and reason in the modern world. Harris argues that in the presence of weapons of mass destruction, we can no longer expect to survive our religious differences indefinitely. Most controversially, he maintains that “moderation” in religion poses considerable dangers of its own: as the accommodation we have made to religious faith in our society now blinds us to the role that faith plays in perpetuating human conflict. While warning against the encroachment of organized religion into world politics, Harris draws on insights from neuroscience, philosophy, and Eastern mysticism in an attempt to provide a truly modern foundation for our ethics and our search for spiritual experience. Fear not, Ravi Zacharias has written an eloquent yet firm response to Sam Harris&apos;s new book: The End of Reason. Zacharias writes not only in response to Harris&apos;s work but also to refute other well-known atheists, such as Christopher Hitchens and Richard Dawkins, whose work runs along the same lines as those of Harris&apos;s. He opens his text by sharing his personal story of growing up in India, which some say is the most religious country in the world. Zacharias, though, says that many live there as practical atheists. Ravi&apos;s writing in this book is much more, for lack of a better term, aggressive. Ravi says, “this is the most strongly worded book I have ever written.” He does not make any personal attacks on any of the neo-atheists, and he is always the consummate gentleman in his analysis and arguments. But in his stern condemnation of the irresponsible and reprehensible writings of Harris and his cohorts, Ravi takes on something of the persona of a professor who is reprimanding students who have been lazy in their application of critical thinking. Indeed, the light of Ravi&apos;s well-written arguments illuminates the writings of the neo-atheists in general, and Sam Harris&apos; writings in particular. Because The End of Reason is well-written, short, to-the-point, and logical in its arguments, you will love it and read it more than once.